Now that Stephen Strasburg has signed a record $15.1 million deal and been introduced to the media in the nation’s capital, it seems nothing can get in his way, right? He’s going to be in the majors next year, right? The Nationals stand a chance, right? The answer to all of these questions might be up in the air, but I’m going to be skeptical and say no. This guy is unbelievably talented. He can throw his fastball 103 miles per hour and has a curveball that seems like it would baffle major league hitters today. He was the most dominant college pitcher in years, possibly ever. And now he’s on his way to the Arizona Fall League, the premier showcase for prospects all around MLB, a month and a half from now. What’s wrong with this guy, then? Nothing, on the surface. However, you have to ask the question, “how many pitchers picked in the first round have amounted to anything in the last couple decades?” The truth is, not many. Roger Clemens and Justin Verlander spring to mind, but the last ten years of Clemens’s career were tainted by steroid use, and even Verlander had a terrible 2008 season. Other than those two, recent drafts have been populated by underachievers (Todd Van Poppel, Bryan Bullington), injury-plagued flameouts (The Cubs’ two-headed monster of Kerry Wood and Mark Prior), and nobodies (Brien Taylor, Adam Johnson). For whatever reason, pitchers drafted high each year seem to hit a wall, either falling apart in the minors or failing to put all their tools together once they make it to the bigs. Then there’s the mechanics issue. 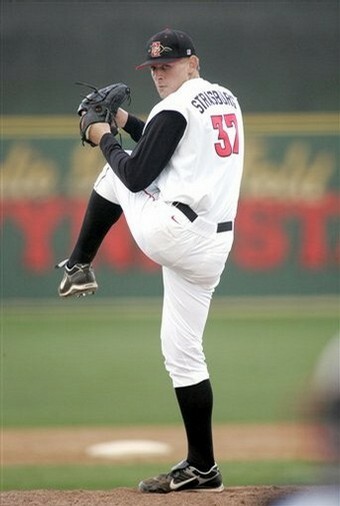 Strasburg seems to be the maximum effort type of pitcher, placing a ton of strain on his arm with every pitch. You can see in this video how much torque he gets as he whips his arm toward the plate. This creates what is called “the inverted W,” where the elbow has to pick up the slack that the rest of the pitcher’s body should be carrying. Some pitchers have found ways to get around this problem, such as John Smoltz relying on the less stressful changeup, but many fireballers like Strasburg end up needing some sort of elbow or shoulder surgery. Draft history and mechanics issues aside, it should also be pointed out that Strasburg has a lot of pressure coming into the big leagues. He was chosen to be the savior of a team that stands absolutely no chance of contending for at least two years, and he will have that intense spotlight on him all the time. Every. Single. Pitch. If he struggles, the media that loves him so intensely right now will turn on him at the drop of a hat. The few Nationals fans that aren’t too embarrassed to show up to games will begin booing. He’ll be scrutinized like no other player in Montreal Expos/Washington Nationals history. If that isn’t cause for a trip to the DL for mental fatigue, I don’t know what is. I hope I’m wrong with all of this. I want to see the guy be that special prospect that wins the Rookie of the Year award and follows it up with several Cy Young seasons. I want to see him break strikeout records left and right. The fans in Washington deserve it after bearing the travesties that have taken the field in that city the last several years. I’m just not sold yet.